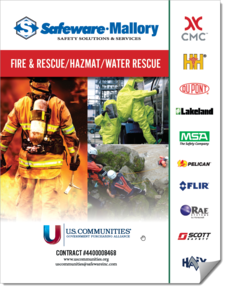 For over 30 years, the Safeware-Mallory team has provided public safety equipment nationally with key expertise in personal protective equipment (PPE). The team services and supports all aspects of safety and public safety from law enforcement and fire service to public utility and public works crews. Our value to public agencies is product knowledge with subject matter experts in the field. Safeware-Mallory offers national coverage with regional expertise. Responding quickly to customers' emergencies can be illustrated by our sustained efforts during 9/11 and our direct involvement in response to the California wildfires. Response and assistance in these events and our company history uniquely position us as experts in public safety and response. 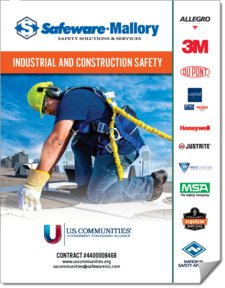 4400008468 - Safeware, Inc. & Mallory Safety and Supply LLC. Ability to consolidate large lists of agency requirements into one competed contract to free up your time to focus on more important department objectives. How do I place an order with Safeware-Mallory? Order Confirmations: Safeware-Mallory will email or fax order confirmations to the purchaser on the order for review. To order online, new customers register as a new customer to receive your customer ID. Existing customers register using your customer ID. All items reflect OMNIA Partners pricing for registered shoppers after login. What if I was already a Safeware or Mallory customer prior to registering to become an OMNIA Partners participating agency? Safeware and Mallory will transfer your account to an OMNIA Partners account so you will receive the discounted OMNIA Partners pricing and benefits. My agency requires competitive solicitation. Can I use this contract without going out to solicitation? Yes. The contract was competitively solicited by Fairfax County. Local governments can "piggy-back" this competitively solicited contract through OMNIA Partners. This generally satisfies the competitive solicitation requirements in most states. See state by state laws on intergovernmental purchasing. Complete the free online registration found on the OMNIA Partners website. During the registration process, you will be asked to mark suppliers you are interested in. The suppliers that you select will contact you with detailed pricing and ordering information. Does this really save time and money? The time and effort associated with creating and managing solicitations can be high depending on the size and complexity. OMNIA Partners allows agencies to bypass the solicitation process utilizing a competitively solicited contract thus reducing both direct and indirect procurement costs. How do I know I'm getting competitive pricing? This contract was competitively solicited by Fairfax County ensuring that agencies are getting very competitive pricing on any size order. There is no minimum quantity required and there are no freight charges for non-hazmat shipments. Fire, Hazmat & Rescue solutions have evolved over the years. We here at Safeware-Mallory are dedicated to providing the best modern solutions for today's worker. Through Safeware-Mallory and OMNIA Partners, the process is quick and easy, so you can get back to working hard. From turnout gear and detection equipment to communications, SCBA and more. Safeware-Mallory's safety experts can help you find the best solution at the best price without going to solicitation. Today's Law Enforcement face many challenges in their everyday work, the last thing they need is difficulty in purchasing products required to complete their job. Through Safeware-Mallory and OMNIA Partners, the process is quick and smooth allowing them to focus more time & energy on protecting the community. Speak with a sales expert today to find the best safety solution for you. Agencies have concerns with protecting personnel (agency and public), hardware, software, networks and data from physical actions and events that could cause serious loss or damage to an enterprise, agency or institution. This includes protection from fire, flood, natural disasters, burglary, theft, vandalism and terrorism. Safeware-Mallory provides a wide-range of physical security capabilities that include the equipment and installation necessary to enhance the physical security of critical infrastructure such as system design, installation, service and maintenance. Intrusion and Detection devices are critical in maintaining security including Motion-Acoustic-Contact Point-Infrared-Seismic, Magnetometers Sensors, Ground & Water Radar Identification, alarm systems and portal systems including locking devices for access control. Safeware-Mallory provides all of this type of equipment from design to implementation including ongoing service and maintenance. 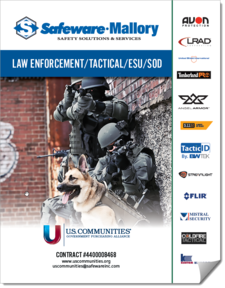 Safeware-Mallory provides design, engineering, installation and maintenance for vehicle identification and intelligent transportation systems through automatic license plate recognition camera solutions (LPR), CCTV utilizing visual, electronic, acoustic, Laser-Radar methods for both fixed and portable installations. Safeware-Mallory has an extensive manufacturer portfolio for visitor management through portable and permanent fences & gates, Jersey Walls, Bullet Proof and impact resistant barriers and doors, along with Enterprise & Communications (Cell, Wireless, Micro, Networking, Downlinks) solutions to Support Surveillance Systems, complex video CCT using standard-Low Light-IR-Auto detection installations for surveillance, assessment conferencing, personal identification systems using visual, electronic, acoustic, scanners, and cyphers/codes. Control of banned items entering restricted facilities including metal weapons, explosive material and biohazards are screened using the latest technology for x-ray, portable biohazard detection and real-time explosives testing. Industrial workers are the blood in the veins of a community. From confined space and construction to electricians, traffic control, and much more, Industrial workers keep the world spinning. Through Safeware-Mallory and OMNIA Partners, the process is quick and smooth allowing you to focus more time & energy on your work. Speak with a sales expert today to find the best safety solution for you. Safeware-Mallory offers a focused group of safety products for schools. Our sales experts can help you find safety solution to keep your campus safe without going to bid. From facility supplies and first aid to active aggressor we have you covered. The Safeware-Mallory team brings national coverage and regional expertise to all K-12 and Higher Education institutions. As opening day for the new Atlanta Braves Stadium approached, the Purchasing Department for Cobb County was tasked with procuring public safety supplies with a must-meet deadline. Read how Safeware-Mallory helped made it happen.